Intimidator UTVs Take on Landscaping and Lawn Care | Intimidator Inc.
It’s that time of year again. The season when you spend your time and effort cleaning up your lawn and making it look its best by adding new flowers and landscaping. While making your property look nice is well worth the effort, it can take a toll on your body. Intimidator UTVs can help lighten the load. 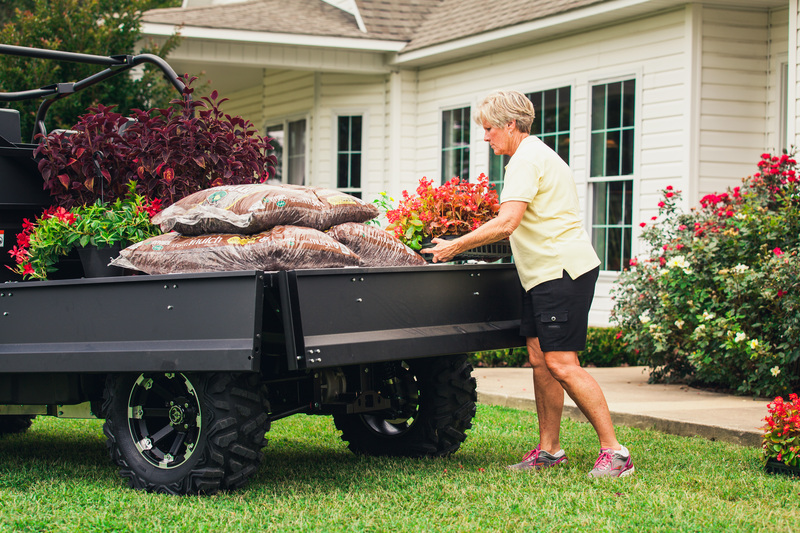 Check out how these utility vehicles can be used to help make landscaping and lawn care jobs a little easier. When most people think of landscaping, they often think of adding a few flowers here and there. However, real landscaping can be tedious and involves more than just adding a few pretty flowers. The truth is that many only add a few new things each year because the task of updating your lawn and property is hard work. That’s where Intimidators come in. These side by side utvs are powerful machines. The Classic series has a full-size bed that can handle a load weighing up to 1,200 lbs. And if you need to hitch up a trailer, it has a towing capacity up to 2,100 lbs. It also has shift-on-the-fly, four-wheel drive that allows you to quickly get out of sticky situations if needed. And once you are done making your lawn look amazing, you can turn on turf mode to protect your lawn from any damage. Whether you are adding a few shrubs or new turf, Intimidator UTVs also have the needed room and storage. The Intimidator Truck Series has a 6-foot, aluminum truck bed that can handle up to 1,200 lbs. And for added convenience, the truck bed easily converts into a flat bed. And if you need to add more people to do the heavy lifting and moving, Intimidator’s Crew Cab can fit up to six adults. With a large crew, you can really tackle weeds, trimming hedges, and other landscaping duties. It also has a full-size bed to help you carry your gear and tools. However, if you do need a little bit more storage, then it’s easy to add storage accessories to your side-by-side utv. You can add a cargo rack on top, in the back, and even on the front of your ride. You can also add storage under your seat. Not only do Intimidator UTVs give you additional power and plenty of storage, but you can use these machines ALL YEAR LONG! If you live in an area that gets a lot of snow, you can add the Intimidator Snow Plow to clear areas on your property that you need access to. For the spring and the fall, you can get a lot of use out of your side-by-side by adding the GroundHog Max Disc Plow. Use it for landscaping and weed control in the spring and get your food plots ready for hunting in the fall. When it comes time to purchase a big ticket item like a side by side utv, many people want to know what it can and cannot do. Can the SXS tackle the tough terrain of backwood trails when hunting? Can it haul feed and hay to the animals around the farm easily? Can this side by side stir up dust with the big boys on a weekend ride? With Intimidator UTVs, the answer is yes, yes, and yes. 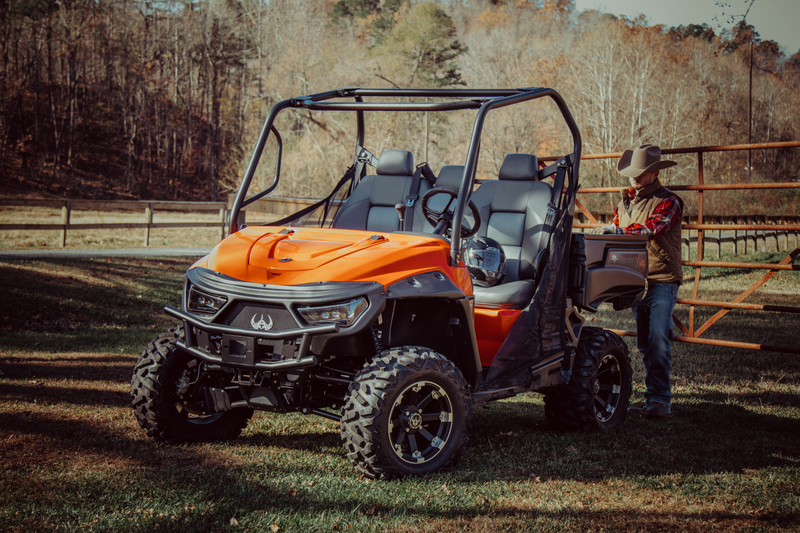 When Intimidator UTVs were being designed, it was important to come up with a ride that could be used for more than just tearing up the trails. Today’s Intimidators are designed to work, hunt, and play. And with the variety of options available for these side by sides, those looking to buy can really customize their new ride to do everything they need it to do. From tearing up trails to hauling sod around a new build, Intimidators can simply do more. Need to see these rides for yourself? Click here to visit our Dealer Locator. Type in your zip code and find an Intimidator UTV dealer near you today.